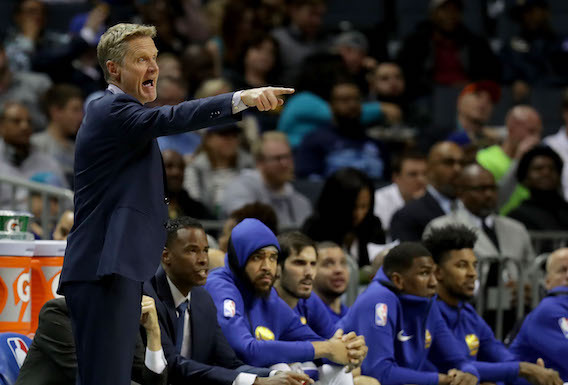 Steve Kerr and Klay Thompson talk about the Golden State Warriors’ Christmas Day date with Cleveland – and winning with injuries. I wonder what it’s like playing as a player on Christmas Day. Do you get to see your families, and how do you go about preparing for that? KLAY THOMPSON: It’s a lot of fun. It’s an honour to play on Christmas Day because the NBA, if they schedule you, it means you’re doing something right. There are so many families and kids watching around the country. I remember watching as a kid, and to be a part of it as an adult is a much better experience. It’s just so fun doing what you love on a beautiful holiday. What was the difference when you had to play in 2015 at home versus last year when you had to travel on that holiday. KLAY THOMPSON: Well, the difference is being able to sleep in your own bed, being in the comfort of your own home compared to being in a hotel. In Cleveland, it’s a lot colder than it is in California. It’s more fun playing in front of your crowd, I would say. It’s always fun playing on the road. Cleveland is a hostile place to play. They’ve got great fans. They don’t like us very much. It makes it a lot of fun. But the difference is just being more comfortable in your home and with your family. Your family is here and they’re there to support you and open gifts and just great vibes all day. I wanted to ask you, are you worried about the ejections of Kevin Durant? He’s already had three, that’s the most in his entire career. STEVE KERR: Yeah, I’m not worried about it. I think Kevin went through a couple of weeks where he was pretty frustrated. Things weren’t going that well for him, and he was getting angry. I had the same problem. I got a couple of technicals during that time, and I was getting frustrated. I think since that time, we’ve done a much better job as a team of not complaining to the officials and just focusing on the game and playing and understanding that you’re going to get some bad calls. That’s just the way the game works. It’s a very difficult game to officiate. So Kevin has done a better job of handling all of that, and I’m not worried about it at all. How hard is it to play without Steph Curry on the floor now that he’s injured? KLAY THOMPSON: Well, we obviously miss Steph incredibly. He’s one of the best players in the world, so not to have him out there is unfortunate. But while he’s not here, we do not make excuses for his absence. We still try to do what we do without him, and that’s just play hard, play together, and win as many games as possible. We’ve been successful without him so far because of our depth, and we don’t make excuses when some of our best players are injured. We still have fun, go out there and try to win games, but we obviously miss him dearly. Kevin Durant has been so effective on the defensive end. What has evolved in him in his time with the Warriors, and what do you expect from the matchup on Christmas against the Cavaliers? And also, we have seen how Jordan Bell has played so far, especially on the defensive end. Can he be the next Draymond Green? STEVE KERR: Kevin has been really good defensively this year, blocking a lot of shots. He’s just using his length and his athleticism and playing with good energy, so that’s the main thing. He’s going to be having a really fun matchup on Christmas Day with LeBron, and that’s always one of the best matchups to watch every year in the NBA. Jordan Bell is doing really well. He’s coming along. He’s learning a lot from Draymond. He’s playing a similar style, guarding everybody on the floor. That’s kind of how the NBA works these days. You have to be able to guard big guys and guards, and that kind of versatility is really key for us. I don’t know if he can ever become Draymond Green, but he’s definitely on his way to becoming a very good player. What do you think, from the start of your career until now, what things have you learned from this team and this coach? KLAY THOMPSON: The best thing I’ve learned about this team since my career begun? Well, just the humility the team has. We’ve got so much talent, guys who could be superstars for other franchises, but really all they really care about is winning. We all have healthy egos. We do all have egos, but we don’t let it get in the way of what’s really important, and that’s winning championships. I never would have envisioned myself having two championships within six years when I started, and hopefully many more to come. But that’s one thing I’ve learned about this team, that we have guys who put the team first and want to win on top of everything. No one is out there to get theirs or get their individual numbers. We all just want to win. Last year you signed a toaster, and the Warriors went on a great winning streak. I would like to know if you’re making this a tradition, and if so, what are you going to sign this year? KLAY THOMPSON: Oh, man, I have no idea. Hopefully something that will propel us to another championship. But it’s got to be something that’s different and unique. I mean, the toaster streak was pretty funny, but hopefully not another home appliance. It’ll be something like a surfboard or something cool, not a toaster. You are the only Golden State Warriors player to play and be available for every game this season. This also has you to leading the team in three- pointers this year. Since you, Steph and KD are arguably the three best shooters in the league, do you bring that stat up, or is it something on your radar or are you even aware of it? 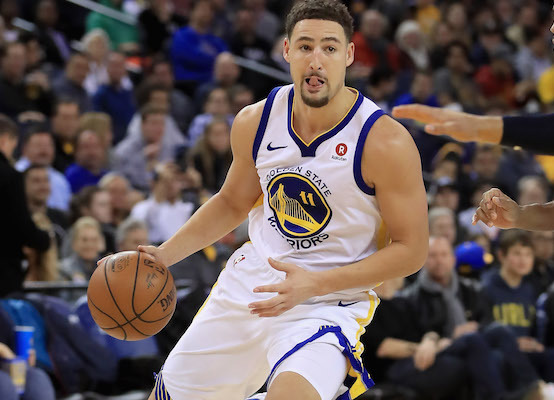 KLAY THOMPSON: Honestly, man, I don’t even think about statistics when I play, but it’s just so great to have guys who can shoot the ball so amazingly on the same team because it makes us so much better throughout the year. Throughout practice we push each other. I’ve never played on a team with guys who shoot it better than me. Now I’ve got two guys that arguably do, and it just motivates me to be better. That’s why I think I’m shooting the ball at such a high level this year. You guys are aiming to make your fourth straight Finals, but the team is pretty banged up right now. What’s been the biggest problem you’ve been facing just trying to win games and trying to be consistent and maintaining good habits? STEVE KERR: Well, I think we’ve done a good job. We’re winning games and dealing with the injuries, and that’s what you have to do when you’ve been to The Finals a few years in a row. It’s just going to be more difficult. I felt that as a player in Chicago way back in the ’90s. Year three was much more difficult than year one, and that’s what we’re facing now, just the wear and tear of the journey. As long as we can win games while guys are out, we’re confident that they’re going to actually be healthy and will be ready to go for the playoffs. This is all sort of expected in many ways, and we’re dealing with it the best we can. Your team has won 10 straight games. Which team will you be more anxious to play against in the playoffs this year, the Rockets or Cavaliers, and which team in the East do you see as your most likely competitor in The Finals this year? STEVE KERR: Well, in the East, obviously Boston and Cleveland are the teams that are getting the most recognition, but Toronto has very quietly had a great season, and I think they’ve gotten better. So those are the three favourites in the East. Obviously, Houston has had an amazing start in the West, and they’ve got a great team. San Antonio is always going to be there. So those are sort of the main teams that I think look like title contenders. But so much can happen over the course of a year with injuries and how things go, so we’re not too worried about The Finals or the playoffs even. We’re just trying to be the best we can be right now and keep getting better. I would like to ask about your back, your health condition, if you are fine now and if you still have some pain, and also if having this kind of injury did change a little bit your perception of the big picture. You didn’t take for granted the success you had and just focus on the results, but also on the big picture of everyday life, everyday little step by step? STEVE KERR: I think any time you go through a major health crisis, it gives you a different perspective. So really the only thing that matters is your health and waking up and feeling good, and that’s the main focus. I’m still dealing with pain but getting better. I love coaching, and coaching helps me to deal with everything. I know you’re playing this game against the Cavaliers in a few days. You might be playing with some of those guys in the All-Star Game with the way things have changed with picking teams this year. Are there any guys from the East you’re potentially looking forward to teaming up with in the game if you potentially make the All-Star team? THOMPSON: I think it would be cool to play with Kevin Love just because I grew up with that guy since I was 8 years old. That would be cool. We haven’t played on the same team since we were kids. To play with him in the All-Star Game would be pretty special. It’s always fun competing against them. Whoever else, I don’t know. I’ve played with a lot of guys just through USA Basketball. I mean, it would be fun to play with LeBron just because I’ve always gone against him, and it would be cool to see him like on a teammate aspect. But who else? I mean, I don’t know. Most guys I’ve actually played with through Team USA. Those two on the Cavs, probably.